"through this book of nonfiction snippets, however enlightening, the idea of the author seeing a much bigger picture emerges, one best told through the experience of the different parts." Charles R. Morris describes the Great Depression as "an evergreen topic," like any of America's major wars, but also "a world phenomenon, with roots in World War I." It began with the United States overheated economy but "it was the global Crash that turned an American correction into a Great Depression." Rabble of Dead Money begins with a discussion of the failure of the German Von Schlieffan Plan to bring down France. Those pages are interesting reading but fail to illustrate the "atmosphere of distrust, prevarication, hysteria, indecision, misunderstanding and internal misdirection" that led to the economic aftermath of World War I. The book that follows is largely an entertaining and educating hodge-podge without any discernable connections. After those distractions and wanderings, the author touches on the debate over the fairness of the financial reparations imposed on Germany after the war. Germany eventually only "paid about half of the reparations, the greater part of it with borrowed money that was never repaid." Morris argues that Germany's losses did not even cover Frances's reparations from its war with Prussia in 1870–1871. The outcome of the German speaking communities taken away followed a similar path, what Germany lost in the short-term never began to make up for a Europe "awash in fear and mistrust." Europe's "markets were broken, it's treasures impoverished, it's populations restive, and radicals of the left and right were sowing violence and disorder." A Rabble of Dead Money continues with a collection of short essays on F. Scott Fitzgerald, Thomas Edison, Henry Ford, etc. Even individual chapters break down into a wilderness where radio networks, Charles Lindbergh, movies, and the African American migration fall within a patchwork of only a few pages. This collage has buried within it too many such easily missed major points such as "from 1921 through 1929, the [American] economy grew by 5% per year in real (inflation-adjusted) terms" as "the consumer culture took hold up and down the ladder." Elsewhere, the author declares, in another example, "measured by its economic impact, the evolution of consumer credit was nearly as portentous as the light bulb." Plowing through this book of nonfiction snippets, however enlightening, the idea of the author seeing a much bigger picture emerges, one best told through the experience of the different parts. Some themes seem to move through the book like characters: the automobile industry, electricity, entertainment spending etc. The greater story is that seven years of the 1920s "would bring, first, a decade of dark Depression, followed by a decade of raging war with hellish forces of Unreason" a point that the author wandered away from at the beginning of the book. Morris never really reached it. Chapters toward the middle of the book do deal with what debt and reparations meant in post-World War I Europe. Morris makes the argument that America became "a country with only the barest of governance, the most rudimentary of economic institutions, and little inkling of the cataclysm that was about to crash around it"—or maybe he did not. 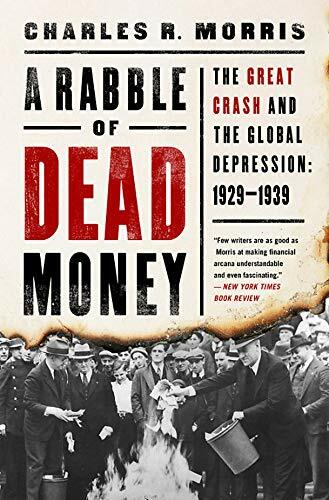 A Rabble of Dead Money has within it a book about how the Crash of 1929 did not start the Great Depression but that it became an icon for exploding credit, Europe's complicated debt situation, and much more. Morris has written a great many books but here the author tries to pour a great many volumes into one. It is a pleasure, however, to read a book where someone understands the rules of good writing.